Plot: Stanley Yelnats (Shia LaBeouf) is an unusual hero with dogged bad luck stemming from an ancient family curse. Perpetually in the wrong place at the wrong time, Stanley is unfairly sentenced to months of detention at Camp Green Lake for a crime he didn’t commit. There, he and his campmates–Squid, Armpit, ZigZag, Magnet, X-Ray and Zero–are forced by the menacing warden and her right-hand men Mr. Sir and Mr. Pendanski to dig holes in order to build character. Nobody knows the real reason they’re digging all these holes, but Stanley soon begins to question why the warden is so interested in anything “special” about the boys’ find. 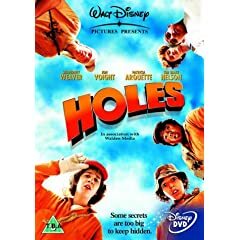 Stanley and his campmates must stick together and keep one step ahead of the warden and her henchmen as they plot a daring escape from the camp to solve the mystery and break the Yelnats family curse. Having had the opportunity to read the book first which I thought was amazing, the adaptation was not bad at all. Shia LaBeouf as Stanley was a good casting choice if not perfect as I was expecting more of an actor leaning on the heavy side just as the book describes him as. LaBeouf is definitely a star in the making. Great supporting performances from Sigourney Weaver and Jon Voight.